When you sit inside the bright orange Audi Q8 concept car, you're greeted with a minimalist interior with no knobs and few physical buttons. Screens, instead, dominate the aesthetic, with the displays acting as your control centers for everything from music to maps to, in future Audi vehicles, the air conditioning and windows. Audi's pristine machine, located inside a climate-controlled demo room at Google IO 2017, is just a concept, but it and a Volvo V90 Cross Country, are designed to show off Google's newest initiative, one that places Android at the heart of it all. Not to be confused with Android Auto, Google's first volley at connected cars, what Google is showing off at IO is the Android OS as we know it. "Android Auto today is an app that's on the phone, so when you connect that to the car or establish that with wireless, the phone is powering the experience in the car," Dylan Thomas, head of partner engineering for automotive at Google, explains. "What we're showing now is there's no need for a phone," he continues. "It's the Android operating system being embedded in the car. So no phone required, and the screen is being powered by the computer in the car, running Android." Android in the car, the best way to describe Google's latest effort, infuses the operating system into nearly every corner of a vehicle. The apps, infotainment system, and even the windows, sunroof, and any connected devices, such as Philip Hue light bulbs and Nest thermostats at home, are all based on and connected through the Android platform. What's more, Google Assistant is a key part of the system, letting drivers use a button on the steering wheel or voice commands to call up Google's digital helper when they need an update on the weather, directions to the nearest sushi restaurant, or any other query. It's important to reiterate Audi's Q8 is a concept, and its Android system was not hooked up to control in-car functions such as rolling down the windows. The Android in Volvo's V90, meanwhile, did have the power to turn on the AC, change the temperature on a Nest thermostat fixed to a fake wall, and alter the color of Philips Hue light bulbs mounted nearby. The Android layout and look for each car was unique, though common apps like Spotify and Google Maps, and, of course, Google Assistant, were staples. A big part of Google's approach with Android in the car is to allow manufacturers to tailor the experience. For Audi, that means using Nokia's Here Maps in addition to Google Maps, and a design that's true to the Audi aesthetic. 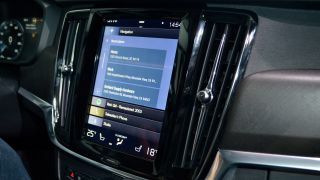 For Volvo, the company can keep the four-tile screen layout that its customers are familiar with, yet rely on Android to run the vehicle's connected components. Allowing for customization is vital to having the experience appeal to both customers and car manufacturers, Google's Thomas explains. "When I spend money on an Audi, it should look like an Audi," he says. "[Customers] don't want it to look like a tablet was bolted onto the car. So customization for OEMs is very important, not just for the OEMs, but actually for the customer." I was curious if Google sees this platform as the next evolution of its connected car efforts, one that leaves Android Auto in the dust as car makers inject Android into the very wires of their vehicles, rather than hook up via tethered device. "We're trying to make a nice, seamless experience of connected services for every car," Thomas offers. "I don't think it's exclusionary. If I have an old Mazda 5, I take my phone, I stick it on the dash and I have Android Auto there. If I have a Q8, then I would have Android embedded in the car. It's not a choice. It's whatever is appropriate." Android Auto, then, is sticking around, with Android in the car available for manufacturers who want a single screen experience. But ask Volvo the same question, whether this embedded system is the future of connected cars, and the Swedish car maker has a different answer. "If you mirror the phone – and honestly [Apple's] CarPlay and Android Auto have taken big steps to ease up the journey to connect yourself into the car, it's a good first step – but it never goes beyond mirroring the phone," says Petter Hörling, director of Volvo's Silicon Valley Tech Center. "As we have showcased in the car, many of the in-car functionality needs to be seamlessly integrated into the experience and preventing having a screen-in-a-screen, so to speak." These cars, while a different beast than we're used to seeing connected by a mobile operating system, are really no different than a phone or tablet running Android. This is a huge plus for developers because they don't need to develop new apps for the car. Instead, the same app made for a phone can be brought into a vehicle, and function in a way that's familiar to customers. "One of the things we're showing in Spotify is playing a track on the main screen and the app is just the same old Spotify app," Google's Thomas says. "It's the same on a Volvo, it's the same as on your phone, my phone. But, the current played track shows up in the vehicle cluster. "So just having information come out from the standard app, and then be available for the OEMs to take that anywhere they want in the vehicle, that's what makes it feel immersive and really part of the vehicle instead of this bolted on thing. It's the difference between slapping a phone on the dashboard and having it in the car." In addition to easing the leap from phone to car for app developers, car makers now have access to Android and can use it in a way that makes sense for their vehicles. That speeds up bringing connected cars to the road. "Our customers want to have the services which are available on their smartphones or at home that they can control with Google Assistant, and for us, it's very difficult to rebuild these services," says Michael Schwenk, project lead of user interface and experience at Audi. Instead of devoting the resources to research and develop a connected car experience that may be obsolete before it goes on sale, Schwenk describes Android as a ready-to-go system, known to developers and backed by Google, that Audi can bring to customers quicker than it can. Just how quickly that is, however, isn't exactly clear. Volvo plans to bring its Android-connected cars to market in two years – "a very short time" due to a "lot of heavy lifting" that still needs to be done on both Google and Volvo's ends, Volvo's Hörling says. Audi, meanwhile, hasn't set a date yet. As for the price of a car running Android, no one was ready to talk specifics, but Hörling says "it's not going to shoot up to the moon." Volvo will talk pricing closer to launch. My impression of Android in the car is that it does allow for more seamless integration of the software versus tethering your phone, however, nothing was so impressive I felt I need to wait until 2019 to buy a new Volvo. The features were relatively run-of-the-mill for our connected-car world, though there definitely is something to be said about letting car makers tailor the experience to their vehicles. The Audi and Volvo were running the same version of Android, but I may never have known that if no one told me. The aesthetics were true to the cars, and it was a welcome change over having the same cookie-cutter system plugged in with a phone app. One issue Google and car makers will have to keep at the forefront is safety. Google's Thomas notes safety is an important consideration when doing anything related to cars, and Hörling says Volvo has taken driver distraction "very seriously." The challenge is letting users interact with their vehicle while also keeping their eyes on the road. Google Assistant may be the answer to this problem as it allows drivers to interact with the car and turn off connected devices at home using only their voice, but there's still plenty of potential for distraction on the screen. This is an early look at where Google's connected car future is headed, and it makes sense to remove the middleman of your phone and have Android simply just work in a vehicle. Hopefully more features and smoother, distraction-free implementation will arrive by the time Volvo, Audi and any future partners' cars arrive in lots around the world, but my peek at Google IO revealed a promising future for Android in the car.